Digitalization has changed consumers behaviours, forcing companies to transform their sales strategies and even to create new services or products adapted to user needs. We created hypothesis of how our potential users could be. 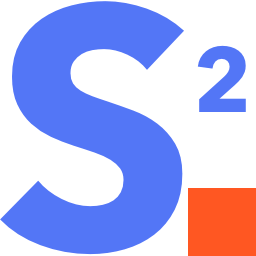 At first, we thought that a content generator could be a user of our application, but it was rejected after the survey results. The field work was carried out during 7 consecutive days, from November 19 to 25, 2018, through a survey in Google form. The survey consisted of a maximum of 12 questions and a single question was opened. This single questions gave us qualitative insights. Of the 135 respondents, 88 surveyed are women (65.2%) and 47 men (34.8%). In addition, 43.2% of respondents are between 35–44 years of age, followed by 34.8% for ages between 25–34 years. 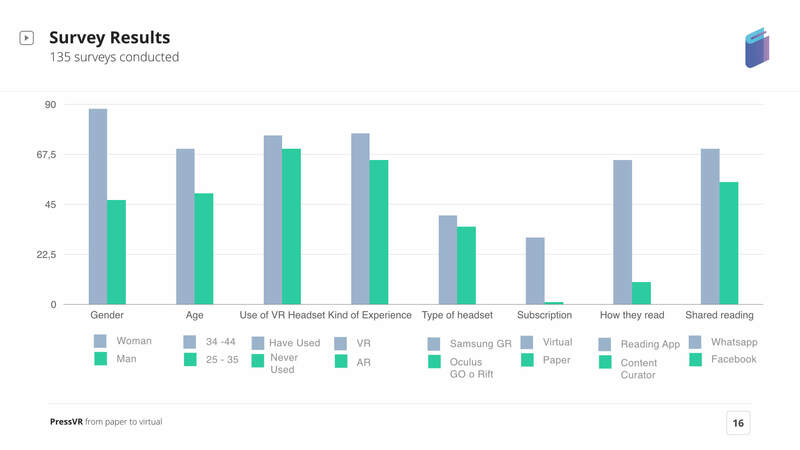 Number of respondents is 135, of which 76 have used virtual reality headsets. Of the 135 respondents, 10% more experienced virtual reality (77 people) compared to augmented reality (65 people). The frequency of use of virtual reality headsets is at least between 1 to 2 times per week. The most used virtual reality headsets are the Samsung Gear VR by 28.9%, followed by the Oculus Go and Rift by 24%. 50% of those who have used glasses have used virtual reality to watch videos and games. Reading formats and sociability degree for readers. Of the 107 people who usually read only 32% are subscribed to digital format and only 7% to paper format. Of the 107 people who usually read 65 people (30%) have a newspaper app or reading platform. Then 10% have curators of content. 60% usually share what they read, but only 45% would discuss issues in a virtual room. The most shared social network of readings is WhatsApp with 70%, followed by Facebook (55%), Linkedin (46%) and Twitter (43%). 83.3% usually save the articles they read to read later. 68% is nourished by information through social networks, 64% usually consult the latest published newspaper or magazines and 34% usually inquire through their favorite editors. Tools of use of the Editor and degree of sociability. Practically 100% writes for digital format in front of paper. 75% of the editors would like to be able to discuss in a virtual room what they have written. Analysis of content and types of formats in newspapers and magazines. We had 8 responses from people reading and working in a newspaper or magazine. 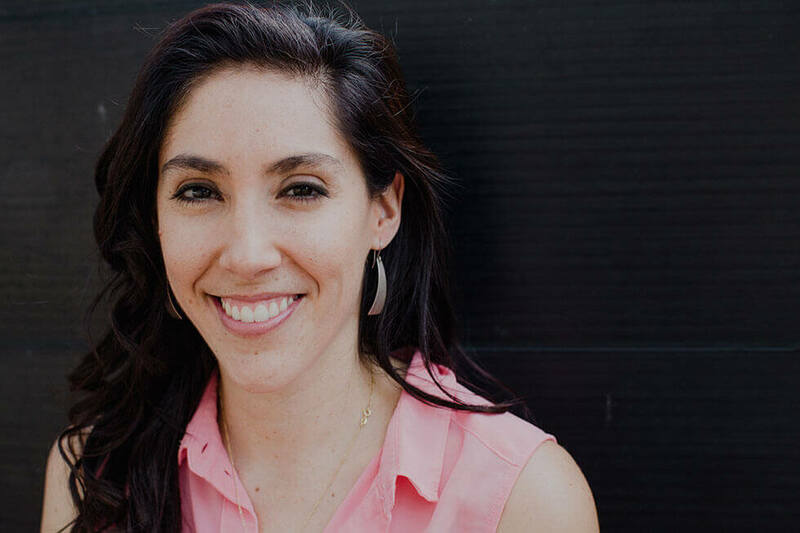 The type of content currently generated is 100% digital. Sections where VR or AR content is generated is 75% in technology, 25% in sports and 12.5% ​​in Time, Travel and Economy. 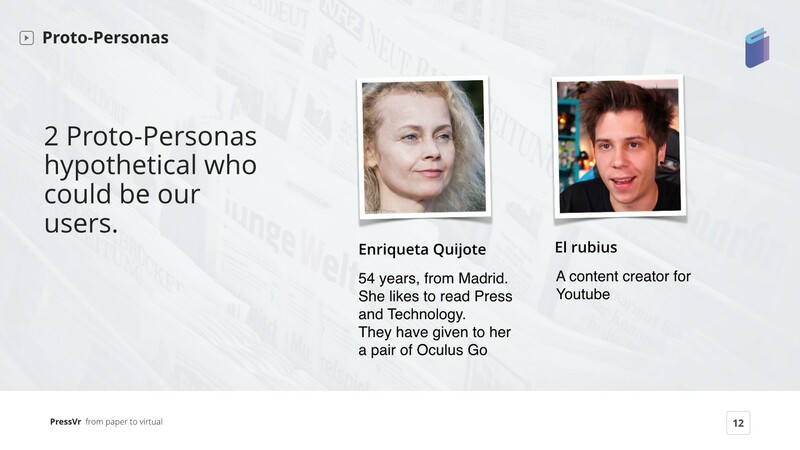 What should a reading app have where you can inform yourself of the news and at the same time you can socialize? Be able to see what people read (MEDIUM type and favorites). Display consumption data and connections. 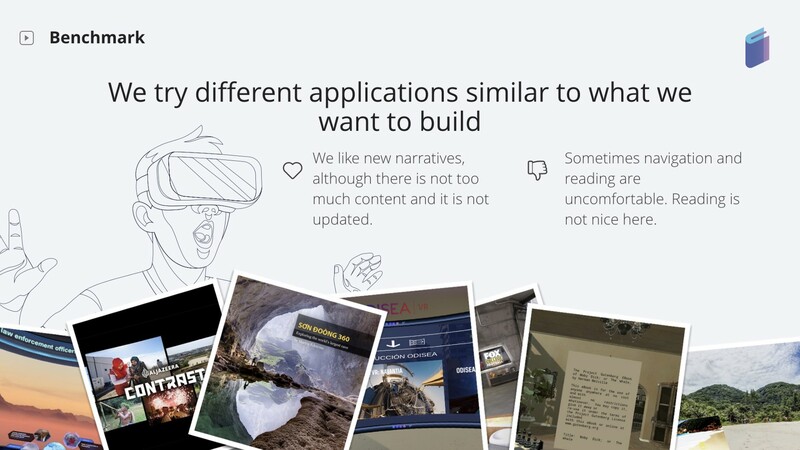 We analyzed 5 applications in VR news and reading. 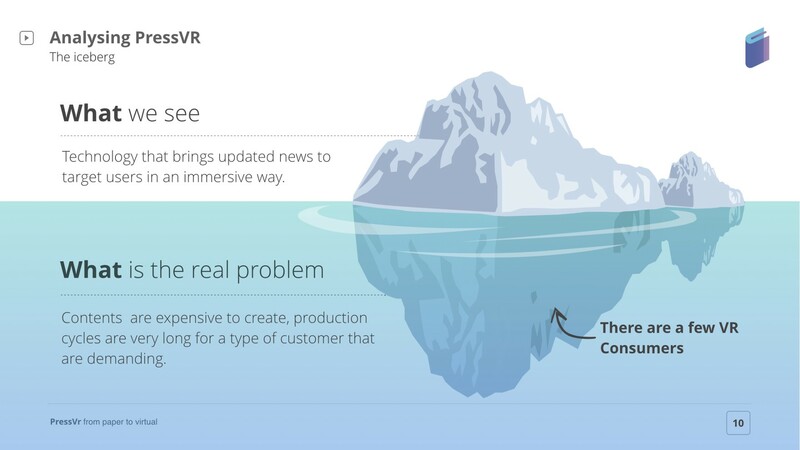 Once the competition is mapped with its pros and cons, we continued with the choice of the platform to design the experiences in VR. You do not need a phone and burn it, and you do not have cables (standalone device) or have to use a PC. 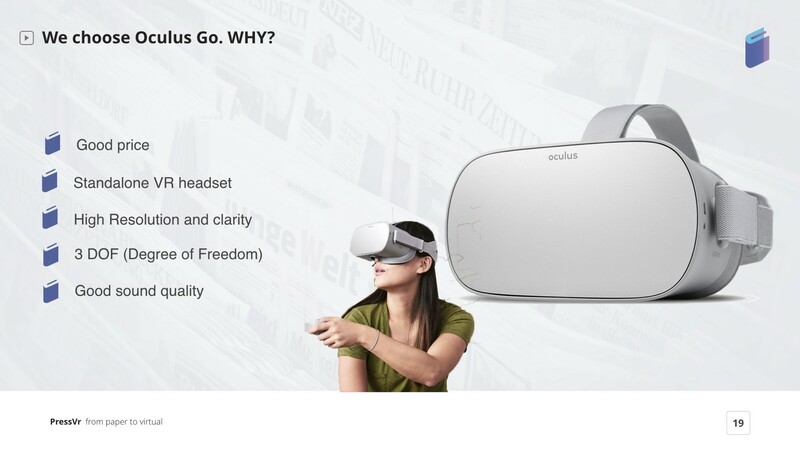 And Oculus Go offers you a good price-quality, around 200 euros. Furthermore, Facebook Oculus Go is between the leaders of AR and VR headsets (with 1.8 millions unit sales, 2017). 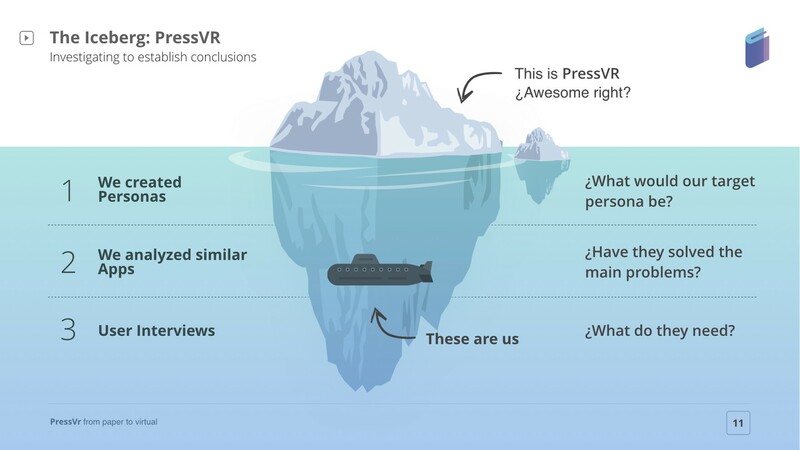 Then, our Press VR Project could reach a wide target of users.